Now that Dave has been in school for 2 months, I’m finally finding my groove again in regards to “surviving” the crazy morning hours with 3 kids all requiring various amounts of help, attention, care, and most importantly FOOD! As much as I’d love our children to be satisfied with cereal and milk for breakfast, I just can’t get them to eat it. Nora and Simon both like the occasional bowl of dried FrootLoops or Cheerios as a snack, but that’s about it. And to be perfectly honest, I don’t love cereal either. Instead, the kids request daily hot breakfasts like pancakes, cheesy eggs and toast, or my homemade Belgian waffles — which means we eat a hot breakfast almost every day. I don’t mind making breakfasts at all… however, it is usually a challenge for me to find the perfect moment to flip pancakes or watch over the eggs while everyone is waking up, getting dressed, going to the bathroom, and getting grouchy because they are hungry. Not only are they ridiculously simple to make, they also taste amazing, and (best of all) they are baked in the oven. This means I can pop them in the oven and do other things while they bake — like change diapers, dress children, do hair, and feed the baby. Then, when the timer goes off, we are ready to eat! 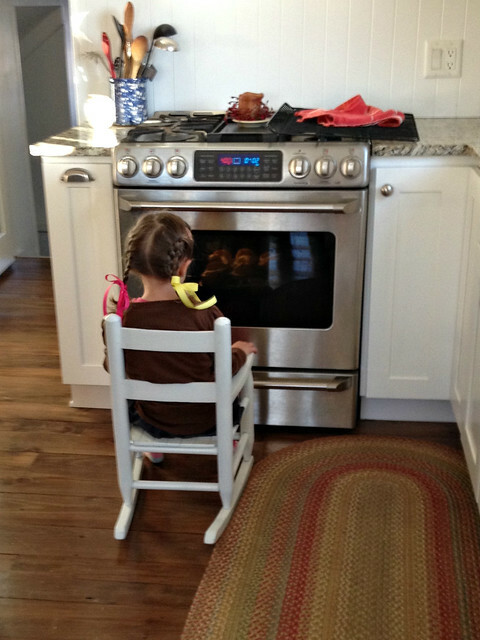 If I’m really running stuck, or if James is a bit fussy, I flip the oven light on and let Nora and Simon watch the pancakes puff up as they bake — built-in entertainment and breakfast all in one! Although these Puff Pancakes have become a breakfast favorite around our house, I’ve also made them for dinner plenty of times — adding some breakfast meat, fried eggs, and smoothies to round out the meal. If there are any left over for dinner, they are quickly gobbled up the next morning for breakfast! Remove from pan, top with optional toppings, eat, and enjoy! 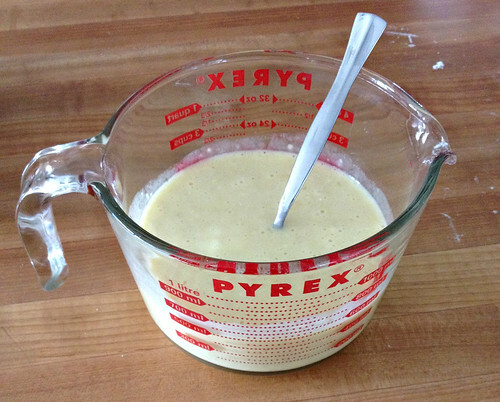 To save myself even more time in the mornings, I will often mix up the batter the night before and just put it in the fridge. 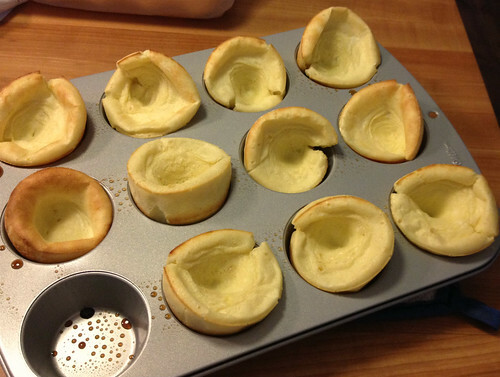 Then all I need to do is pour the batter into the muffin cups and pop it in the oven. Finally, depending on how closely your oven racks are located, you’ll want to make sure to remove the rack above where the Puff Pancakes are baking — the really do puff up extremely high! These baked Puff Pancakes have quickly become one of our favorite fast and easy breakfast foods — even for crazy weekday mornings with 3 little kids! What are your favorite busy morning breakfasts? I’ve never seen anything like these before, but they look delicious! I love this idea! 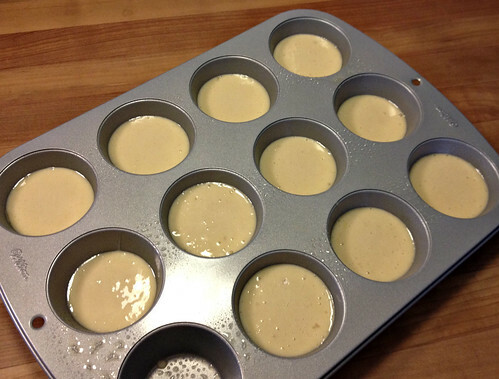 Do you think silicone baking cups would work instead of greasing the pan? I’m looking for less clean up. Or would that not get the same result? Thanks for all your inspiration!! Traditionally (we love tradition in the UK!) one needed a heavy metal pan (large or muffin) to hold the heat and get it all nice and smoking hot before you put the batter in so it puffs up immediately, ergo silicon wouldn’t work for that, but I have never tried it so…. 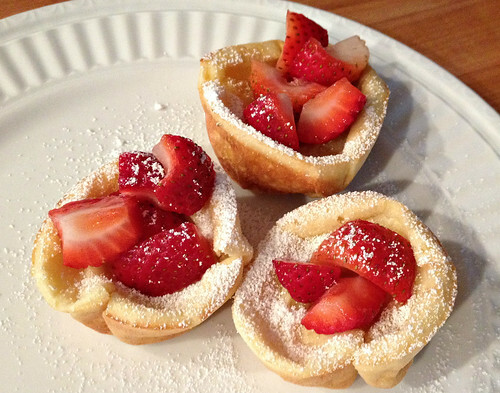 I make these but have never thought about doing it in a muffin tin! I will do this soon! Peaches are my favorite topper. we like peaches too — but strawberries or chocolate + bananas are our favorite! Wasn’t able to print this recipe…..any suggestions?? 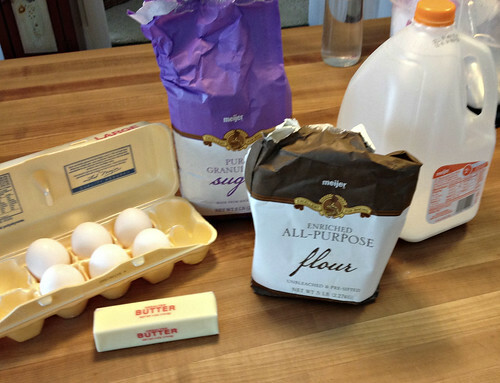 I’m curious…how much your homemade pancake mix for this recipe differs from a pre made/store bought pancake mix? 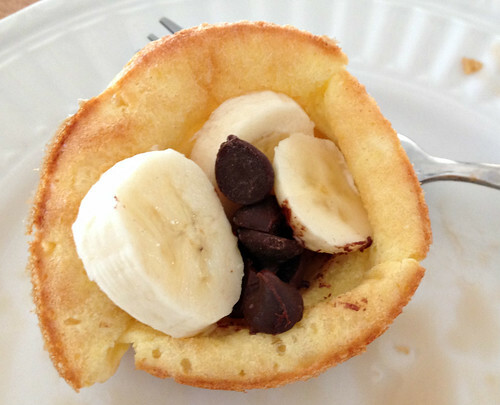 Have you tried pre made/store bought pancake mixes for this recipe? If so how well do they compare to each other? I’m honestly not sure — it’s probably been 6-8 years since I made pancakes from a box. From what I can remember, “from a box pancakes” are quite light and somewhat dry. These pancakes are very heavy, dense, and moist. There are 6 eggs — which is a lot, so they are filling. That’s a Yorkshire Pud recipe 🙂 Try pre-heating the fat in the pan first to get much better puffiness. Careful as you fill them! In the UK we serve them with roast dinners and gravy. Yum 🙂 We also used to eat them at home with golden syrup poured over if there were (rarely) any left over. Seconding Toad-in-the-Hole. It’s very tasty. Just stick some pork sausages (not hot-dogs) into a pan and cook for maybe 10 mins, to get some colour on them and then pour over the batter (best in a large pan). Cook ’til puffed and golden. Ha so funny – this post is flushing out the Brit readers! Thirding the toad-in-the-hole here, and we never have leftovers either. My dad used to have left over Yorkshire pudding for breakfast as a treat before school on a Monday morning, drenched in sugar. Check out the Delia Smith recipe for a trusted version, always works and is perfect for winter evenings. I’ll give it a try for breakfast with fruit, thanks for the idea! interesting — I’ll have to try this. Our kids LOVE sausage! 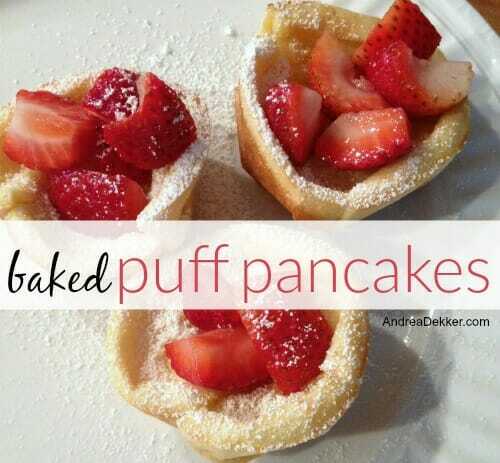 Never thought to bake them in muffin pans! Yummy! Well, I never noticed that! Sorry! I think I was intending to put powdered sugar in the picture to show that you could dust them with powdered sugar after they are done baking. Woops! This is almost my recipe for Yorkshire pudding. We sometimes have it when I cook a roast beef. Next time you make a roast try them with a little butter and salt & pepper on top. They are so much better than plain buns. 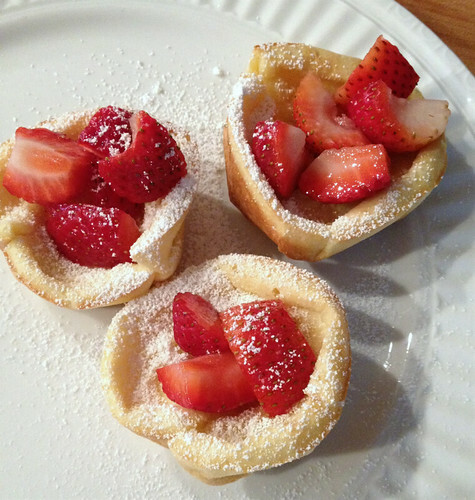 And I will try them for breakfast with fruit on top! This reminded me of Yorkshire pudding, too. I’m not British, but I love reading Miss Read books and decided to try some of the dishes she writes about. Andrea, Nora would probably enjoy Toad-in-in-the-Hole. That’s baking these pancakes with a piece of link sausage in each muffin cup. It’s served with onion sauce, which she might not be crazy about. My small children loved the name and the dish. I never thought to do that — but I suppose they would be good with savory dishes too! Thanks for the tip! I just clicked through to that recipe and realized that my mom made these ALL the time growing up. We called them “Dutch pancakes” but they were the exact same thing! With two teenagers, we often have lots of extra kids here on the weekends…love the idea of a pancake bar using these! oooo… how fun! I think a pancake bar would be a fabulous idea!